How to get to Agia Roumeli? 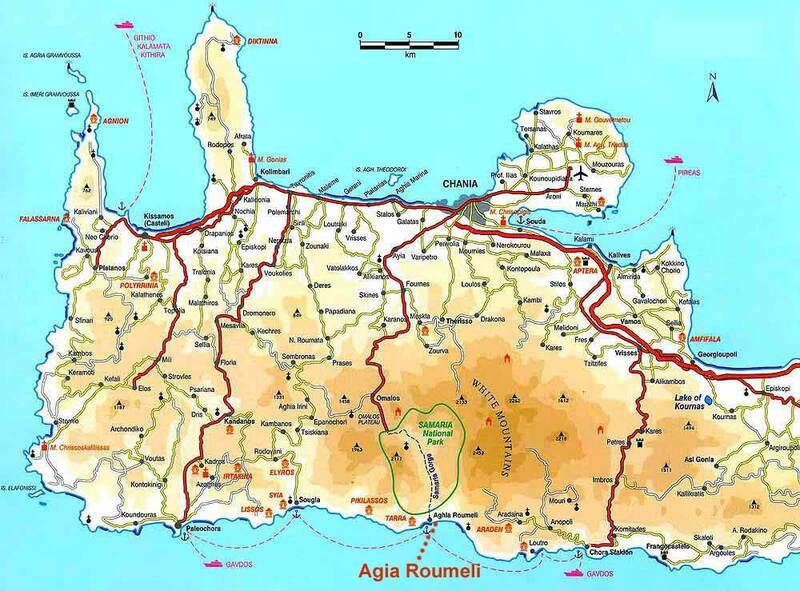 You can have a look at the map of West Crete to see where Agia Roumeli is located. 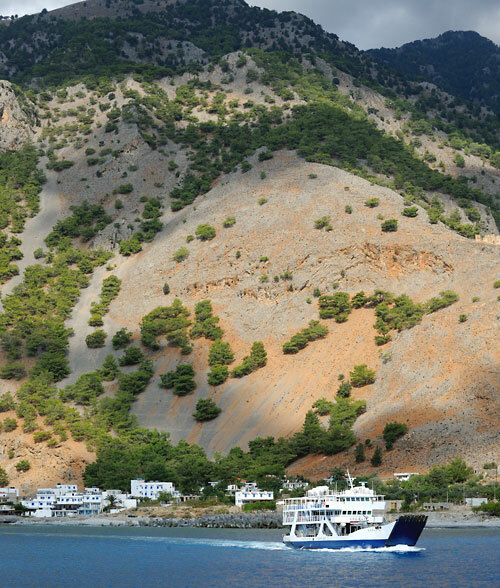 The company ANENDYK runs a regular boat and ferryboat service on the South coast of Crete connecting the villages of Hora Sfakion, Loutro, Agia Roumeli, Sougia, and Paleohora. The time table is limited in the winter months but becomes a daily service at the beginning of April. Once the gorge of Samaria opens to the public (generally at the beginning of May) the line Hora Sfakion – Loutro – Agia Roumeli and back runs about 2 -3 times a day. The route Paleohora – Sougia – Agia Roumeli is available once a day; starting from Paleohora in the morning and returning from Agia Roumeli in the afternoon. The exact times as well as current ticket prices can be checked either on the company's website or by phoning the company in Hora Sfakion +30-2825091101. The travelling time between Agia Roumeli and Hora Sfakion is about one hour and slightly longer between Paleohora and Agia Roumeli. The journey offers suberb views of the wild Lefka Ori mountains and the coast. Please bear in mind that the service may be delayed or cancelled if there are adverse weather conditions. If you want to bring your car to the village, it is possible to take it by ferryboat from Hora Sfakion and Paleochora. However, you will not need a car in Agia Roumeli, so there is no need to rent a car just to get to the ferry departure point. Why not simply take the bus from the North coast to Hora Sfakion? The buses are reliable and safe. You will find the timetable information for the district of Chania here. If you prefer to take a taxi, the cost from Chania to Hora Sfakion is around 90 Euro and around 150 Euro from Heraklion (price from 2011). You can also get to Paleochora or Sougia by car, bus or taxi, but bear in mind that there is only one boat a day - early morning - going to Agia Roumeli. Because of the past significance of Agia Roumeli, the village is accessible by numerous footpaths and trails. The best known one is through the gorge of Samaria and is easy enough if you if you are properly prepared for the 16 km hike. Another route is via the ancient path which links the plateau of Anopolis to Agia Roumeli. You can reach Agia Roumeli in about three hours from the hamlet of Agios Ioannis. This is without doubt the most beautiful coastal walk in the whole of Crete. Another easy path is the coastal path from Hora Sfakion, via Loutro and and Agios Pavlos - this delightful walk takes about seven hours. There are other ways to reach Agia Roumeli on foot; from Sougia, across the mountains from Omalos via Katsaromoura. However, these are best left to very experienced and fit hikers. It can be extremely difficult to navigate these areas, so we recommend that all hikers are accompanied by a local guide.